I'm a big fan of music, and use it a lot when working, but I had no idea about how it really affects our brains and bodies. Since music is such a big part of our lives, I thought it would be interesting and useful to have a look at some of the ways we react to it without even realizing. 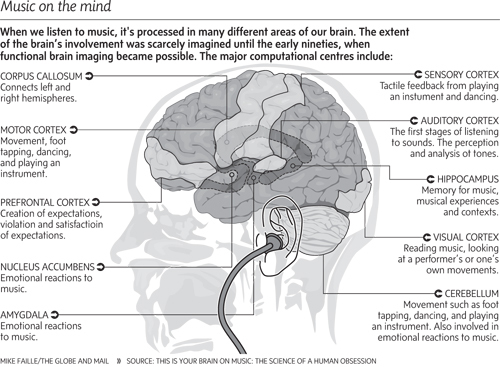 Of course, music affects many different areas of the brain, as you can see in the image below, so we're only scratching the surface with this post, but let's jump in. We can usually pick if a piece of music is particularly happy or sad, but this isn't just a subjective idea that comes from how it makes us feel. In fact, our brains actually respond differently to happy and sad music. Even short pieces of happy or sad music can affect us. One study showed that after hearing a short piece of music, participants were more likely to interpret a neutral expression as happy or sad, to match the tone of the music they heard. This also happened with other facial expressions, but was most notable for those that were close to neutral. Something else that's really interesting about how our emotions are affected by music is that there are two kind of emotions related to music: perceived emotions and felt emotions. This means that sometimes we can understand the emotions of a piece of music without actually feeling them, which explains why some of us find listening to sad music enjoyable, rather than depressing. Unlike in real life situations, we don't feel any real threat or danger when listening to music, so we can perceive the related emotions without truly feeling them--almost like vicarious emotions. We all like to pump up the tunes when we're powering through our to-do lists, right? But when it comes to creative work, loud music may not be the best option. It turns out that a moderate noise level is the sweet spot for creativity. Even more than low noise levels, ambient noise apparently gets our creative juices flowing, and doesn't put us off the way high levels of noise do. In high noise levels, however, our creative thinking is impaired because we're overwhelmed and struggle to process information efficiently. Take this one with a grain of salt, because it's only been tested on young adults (that I know of), but it's still really interesting. In a study of couples who spent time getting to know each other, looking at each other's top ten favorite songs actually provided fairly reliable predictions as to the listener's personality traits. The study used five personality traits for the test: openness to experience, extraversion, agreeableness, conscientiousness and emotional stability. Interestingly, some traits were more accurately predicted based on the person's listening habits than others. For instance, openness to experience, extraversion and emotional stability were the easiest to guess correctly. Conscientiousness, on the other hand, wasn't obvious based on musical taste. , there is some clear overlap. done on teenagers and young adults focused on how their driving is affected by music. Drivers were tested while listening to their own choice of music, silence or "safe" music choices provided by the researchers. Of course, their own music was preferred, but it also proved to be more distracting: drivers made more mistakes and drove more aggressively when listening to their own choice of music. Even more surprising: music provided by the researchers proved to be more beneficial than no music at all. It seems that unfamiliar, or uninteresting, music is best for safe driving. These two areas in particular are quite removed from musical training as we imagine it, so it's fascinating to see how learning to play an instrument can help kids develop such a wide variety of important skills. It's not just kids that can benefit from musical training or exposure. 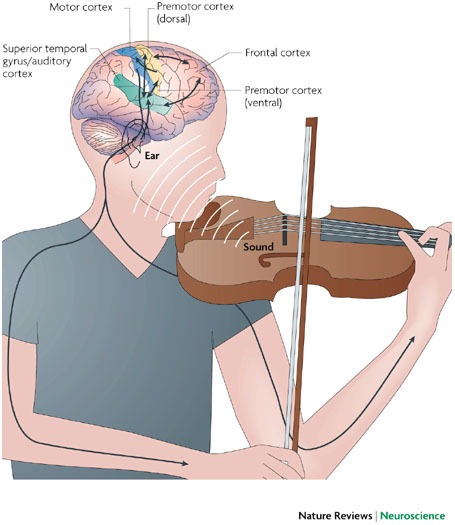 Because this study was so small, the conclusions need to be explored further for validation, but I find it really interesting how music and noise can affect our other senses and abilities--in this case, vision. After a survey showed that up to 82% of people find overhearing cellphone conversations annoying, Veronica Galván, a cognitive psychologist at the University of San Diego, decided to study why these are such a pain. In the study, participants completed word puzzles while one half of them overheard one side of a mundane phone conversation in the background. The other half of the volunteers heard the entire conversation as it took place between two people in the room. Those who heard the one-sided phone conversation found it more distracting than those who heard both people speaking. They also remembered more of the conversation, showing that it had grabbed their attention more than those who heard both sides and didn't remember as much of the discussion. The unpredictability of a one-sided conversation seems to be the cause of it grabbing our attention more. Hearing both sides of a conversation, on the other hand, gives us more context which makes it easier to tune out the distraction. Then again, as we've explored before, getting distracted is often not such a bad things for various reasons. This happens because listening to music can drown out our brain's cries of fatigue. As our body realizes we're tired and wants to stop exercising, it sends signals to the brain to stop for a break. Listening to music competes for our brain's attention, and can help us to override those signals of fatigue, though this is mostly beneficial for low- and moderate-intensity exercise. During high-intensity exercise, music isn't as powerful at pulling our brain's attention away from the pain of the workout. So in the same way that exercising makes us happier, it's not surprising that music adds significantly to our work-out success. What have you noticed about how music affects you? Let us know in the comments.